Be enchanted by Royal Caribbean's smallest member of the fleet. Cruise away with the Enchantment of the Seas. One of Royal Caribbean’s smallest fleet members, Enchantment of the Seas is certainly not one to disappoint. Commissioned in July 1997, Enchantment of the Seas had an extensive refurbishment in 2005 and now offers an even more diverse program than ever before. This elegant vessel contains 11 decks, 9 pools and whirlpools and a selection of 8 deluxe bars and lounges. Be safe in the knowledge that you will have a comfortable stateroom to retreat to after a day’s adventures of exploring new destinations and tasting exotic cuisine. 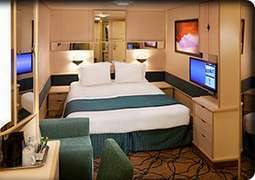 Royal Caribbean’s Deluxe suite offers all the comforts of a grand hotel and more with multiple rooms and private balconies. 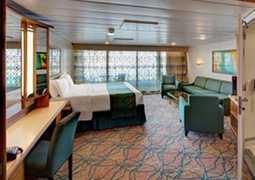 A stateroom with a private balcony will give you the unique experience of getting close to every destination, with panoramic vistas and sweeping landscapes. An Ocean View stateroom offers spectacular views just outside your window, while the Interior stateroom is elegant and nicely appointed with modern furnishings for excellent value. 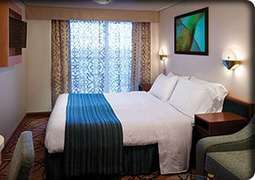 Comfort and cosiness take priority on board the Enchantment of the Seas. You`re bound to feel at home in whichever cabin you choose, no matter whether it is an inner, outer or balcony cabin, or a luxurious suite. Look forward to a delicious culinary adventure on board. No matter whether you’re looking for a scrumptious, juicy steak in the Chops Grille or one of the many varying dishes in one of the theme restaurants, you’re sure to find something to please your palate. Ben & Jerry’s ice cream can be enjoyed by passengers of all ages and you’re more than welcome to wind down the evening with a glass of wine or cocktail in the many different bars and lounges. Feel free to take advantage of the diverse array of entertainment programmes on board the Enchantment of the Seas. Try your luck with a round of poker in the casino, kick back and enjoy the spectacular shows and performances in the theatre or soak in the great ambiance and panoramic views in the many different bars and lounges. You are sure not to get bored! 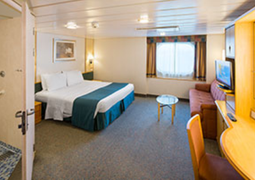 Thanks to the ship`s renovation in 2005, you can now enjoy the comforts of its many great new furnishings and accommodations. For example, swim a few laps in the pool on the new, enlarged deck or have fun in the new waterpark. You also have the opportunity to stroll over the suspension bridges, jump on the Bungee Trampoline or enjoy quiet relaxation in the Day Spa. Those looking for something a little more traditional are welcome to power up on the modern exercise machines in the fitness centre. Another highlight on board is the climbing wall, where all who reach the top are rewarded with a stunning view. On board you’ll find a photo store, a gift shop with great souvenirs and many other stores offering perfumes, jewellery and much more. As across the entire Royal Caribbean fleet, Enchantment of the Seas features the Main Dining Room with its renowned complimentary multi-course dining specials. As well as classic favourites, Enchantment of the Seas has many modern features such as the much-loved Park Café which offers gourmet sandwiches, salads and more for those who are on the go. Treat yourself to some delightful Ben & Jerry’s® icecream on-board and soak up the stunning scenery as you cruise to your next port of call. The staff and crew aboard are made up of a professional team who will ensure your stay on-board is memorable and comfortable, offering a 24-hour room service to tend to any needs you may have.